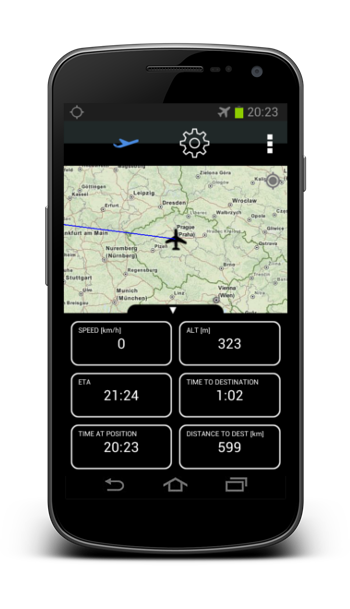 Android application tracks your in-flight progress with aid of GPS satellites! Requires Android 3.0 and higher. 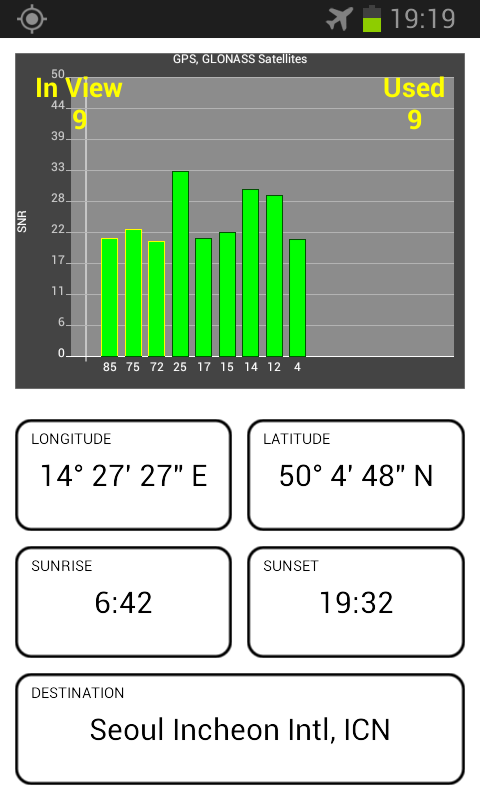 GPS capabilities required, A-GPS recommended for better reception. No internet connection necessary, can be used in Airplane Mode while in the air. YOU CAN DO IT ON A PLANE! 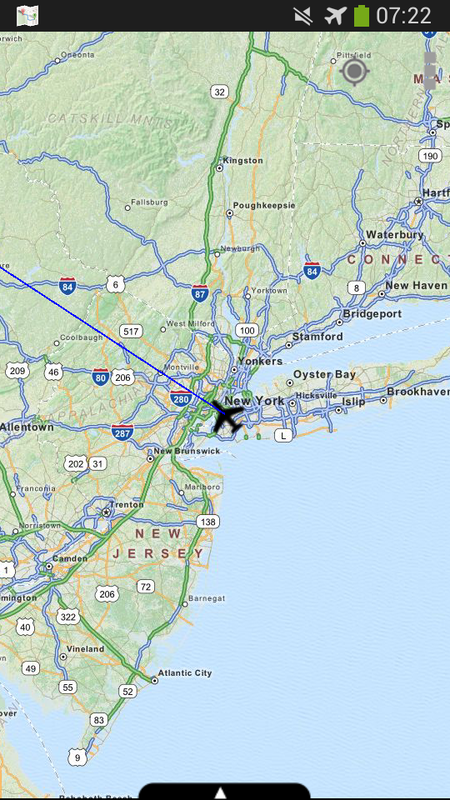 This application works as a sky map in an airplane. 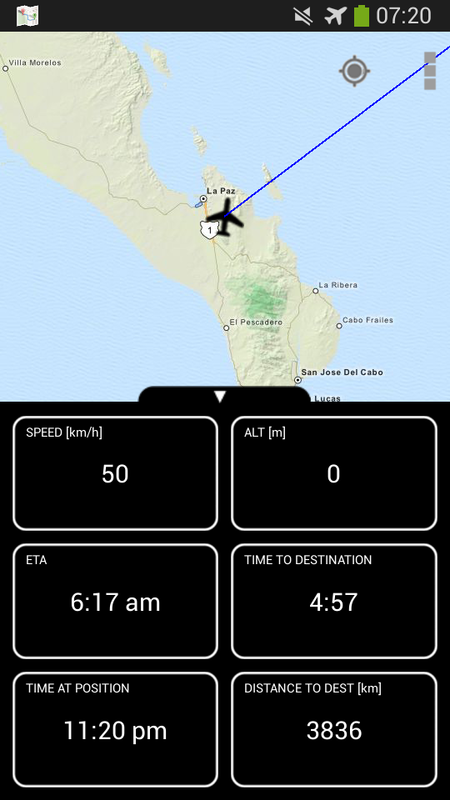 It shows where you currently are, speed, altitude and some other information about your flight. You can check the Estimated Time of Arrival of your flight while you are sitting on a plane. You can see how far from the target airport you are. You can also see and name the landmarks on the way, so that you know what you see from your window. 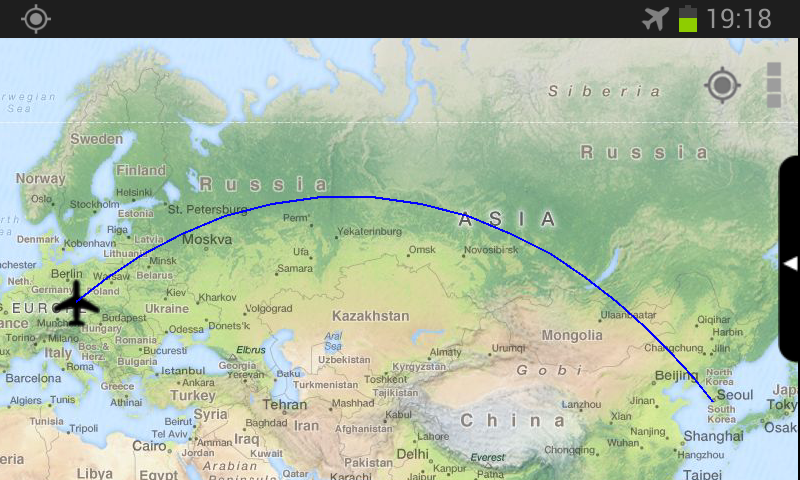 The application also displays visible and used GPS / GLONASS satellites, so you can use it as a GPS testing tool. The GPS function works when your phone is in airplane mode, because it does not broadcast any radio, it rather listens to the GPS satellites only. Please note that the application is heavily dependent on the quality of your device's GPS capabilities. If your device is capable of A-GPS (Assisted GPS), please run the application while on the ground, so that the satellites' positions get downloaded from the internet, it will be much easier for the device to pick up signal when in the air. Please share your experience with various devices. Most of the time the application works perfectly when sitting in a window seat and does not work too good when sitting two seats from the window or more. In any case we recommend to move the device to the window, let it pick up the satellites signal first and then try how far from the window it can pick up the signal. The screen showing the visible and used satellites is designed to help you with this. If your device is capable of receiving GLONASS signal, the satellites are shown with a differently colored border. 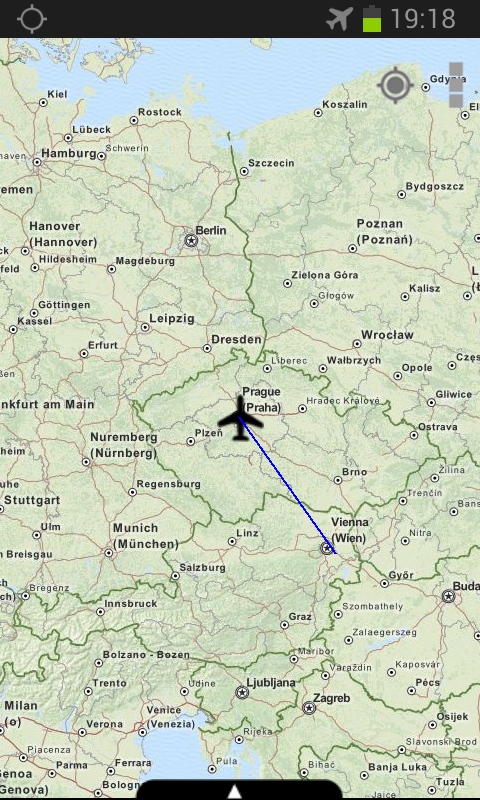 If you want to translate the Flight Map into your language (or correct our translation), please contact the developer. The first run of the application takes a while because it needs to unpack the whole world map to be able to display it. There are three versions available - original Flight Map, Flight Map FREE to test the limited functionality for free and Flight Map HD that includes much more detailed maps of the world. However, it comes at a price of 1GB of space on your phone (as the world is really big). NEWReleased HD version with more detailed maps. NEWReleased FREE version with limited functionality. FIXFixed bug to track plane even without destination selected. FIXFixed crashes on some devices. NEWDeleted menu bar, upheld user recommendation. NEWPolish translation (thanks to Tomasz Pryca). FIXFonts for large and extra large diplays (tablets) enlarged. 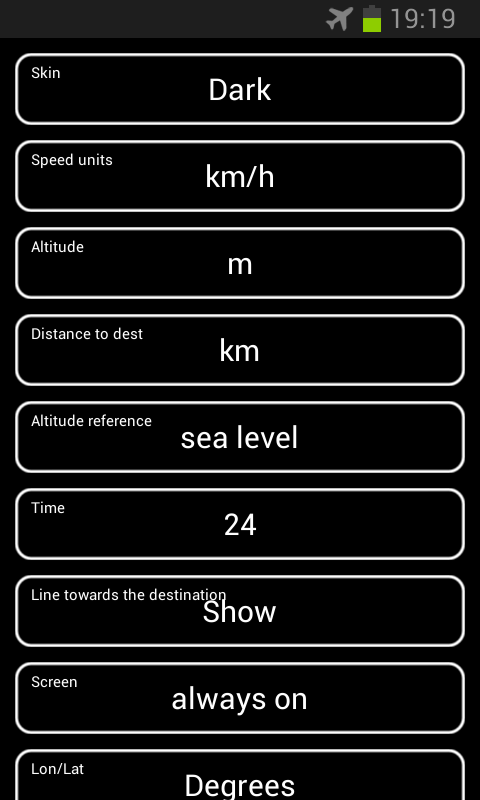 NEWAdded record route function - route starts to be recorded automatically as soon as speed detected is greater than 180 km/h. Route is identified by a date and destination. NEWRecorded route can be shared on social networks (after landing, of course). Some of the worldwide press that has reported on Flight Map. Flight Map has been developed by an independent developer.